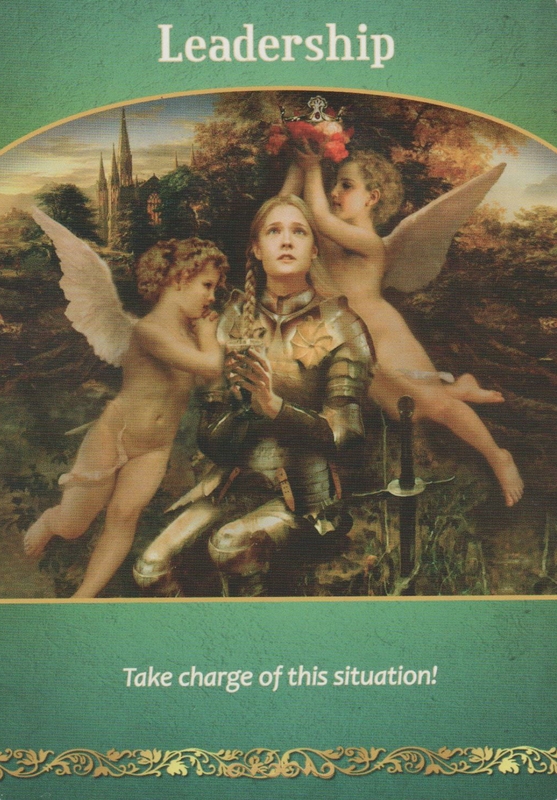 The card reads: Take charge of this situation! The angels are supporting you as you go forward with your dreams. They are crowning you in your glory. Take everything you have learned and make a plan for your future. You have the ability of being a leader but you have to want it. Once you make this decision everything will fall in to place. You don’t have to live in a castle or mansion to be a leader. You can live in a bungalow and be a model for those who think they have to have everything to be a success. They will realize anything is possible no matter where they are in life. Being a leader can mean simply how you live yourself and people follow your example. If you live a “clean” life others will ask how to do so too. If you are a business owner you can share the steps yob took to get there. As a parent we lead our children. Decide if you want to become a leader and what type of leader you wish to be. Once you know this answer go forward and show others how to do this too. Take time to meditate, and listen to your inner guidance, which will clearly show you your first steps upon this path. Your leadership will inspire others to speak up and take charge of their lives as well! I met Dr. Brian Weiss at a Hay House I Can Do It event in 2011. I heard about past life regression but never experienced it. Dr. Weiss taught us how he began his journey working with people and their past life regressions. He was a Psychiatrist and stumbled on this astonishing experience. He was working with a patient and what he thought to be hypnotism turned to something strange. After several sessions with this patient they realized she was talking about another life time. Once they worked through these sessions some of the woman’s problems began to subside. During a regression session with Dr. Weiss I saw myself as a nun in another lifetime. It was an amazing experience and I realized I wanted to learn more. So I went to see him again in New York City for a day workshop. During this workshop we were guided through many meditations where we went deep into our souls and learned more about ourselves. If you would like to learn about Past Life Regressions you can learn from Dr. Brian Weiss at Hay House. 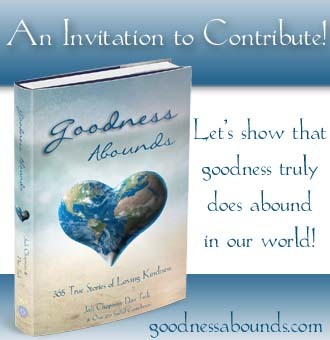 ~~Watch for the release of my newest book: Journey of Angelic Healing, Stories to Feed Your Soul. This is a compilation of all my stories. I am reviewing the layout and will have a release date soon. ~~I began a GoFundMe campaign to help me keep my radio show up and running. If you would like to contribute you can go here: https://www.gofundme.com/spiritual-destinations-radio My gifts to you for your donation are varied depending on the amount. ~~I am looking for opportunities to speak to groups about my journey with mental illness. Please keep me in your thoughts for this to start coming to fruition so I can help others. 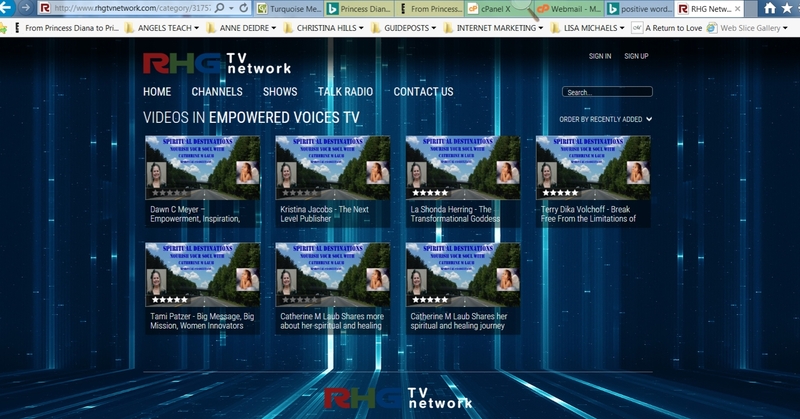 Listen to me interviewing Kristina Jacobs, a Publisher, Editor, Author and Healer. She runs The Next Level Publishing in Minnesota and later this year she will launch her new business, Smash Depression. If you would like to interview with me for Spiritual Destinations, you can schedule an appointment with my calendar. Please schedule here https://www.timetrade.com/book/DNYCN. Once I have your information I will send you a questionnaire to prepare for our talk and for you to email back to me. These interviews will be recorded then scheduled for my show. You will receive a link for your recording that you can share with others. ~~You can listen to my interview with Dawn C. Meyer who uses her unique combination of skills to get people in – bringing more ease and joy to their lives. She does this by helping them discover they have more choices and possibilities for changing what isn’t working in their lives than they ever thought they had. She is an empowering coach, energy healer, best-selling author, inspirational speaker, Access Consciousness Certified Facilitator, massage therapist, Reiki master and former Space Shuttle Engineer (“Rocket Scientist”). ~~I am working with Rebecca Hall Gruyter on 2 new books. I already submitted my story for Bloom Where You are Planted and Shine. This book will release September 27th. The next book will be The Grandmother Legacies to be released by December 2017. I am excited to be working with Rebecca because she is my newest publisher, one of my radio producers, and she is in charge of the Speaker Talent Search. Here she interviewed me in February and was impressed by my story. She invited me to join the search and her 2 newest books. She is also putting me in contact with her colleagues to advance my speaking and more book opportunities. ~~I am working with La Shonda Herring to put together a Telesummit. More details will follow as we create it. 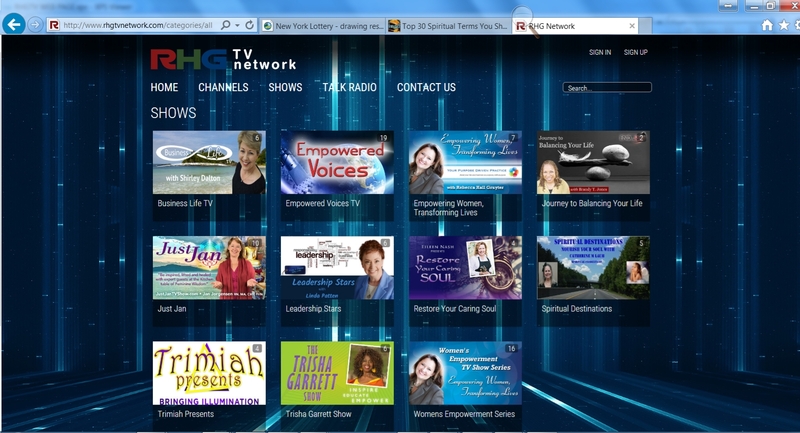 It is The Women’s Healing & Empowerment Summit. Learn from 10 women’s journeys: how they overcame their struggle and pain to walk into their destiny. From May 10th to 19th: Each night a different amazing Dynamic woman sharing their knowledge, skills and expertise’s for 1 hour. We will be hosting a live Q & A retreat. Come join us to hear them speak live! Ask them any question you have. They will also share information that was not in their presentation. ~~If you or a friend ever has a question or needs to talk to me, please don’t hesitate to speak up. I am here to serve and help. I have been through so much turmoil in my life that I know how much we all can use a helping hand. Know that I am here for you. I am here to serve and help. If you send me an email, please remember that I mostly answer after 9 pm because that is my best focus time. If it is something urgent, you can call me at 631-619-2040. ~~I offer many programs and would love for you to learn more about them. As you know, I offer a vision board class Saturday’s. I teach angel communication with angel oracle cards and have a spiritual meetup weekly. You can learn more at my website and if you live close to Lake Ronkonkoma, NY, I would love to get together with you at one of my events. In acknowledgement of your contribution, we will promote your organization on digital signage at the Outing. We would also be happy to provide additional information on sponsorship packages that are available. We thank you, in advance, for your tax deductible contribution. Thanks for being a loyal email subscriber. I appreciate hearing from you. Let me know if you ever have any questions. I am very spiritual and love sharing about spirituality and inspiration. I am certified as an Angel Communication Master and do psychic angel card readings. I am a seven time best-selling author and speak out about mental illness in my campaign “Brighten Your Day with Turquoise”. I live in New York with my husband, Tony, and between us we have 7 children and 14 grandchildren. The only “family” that lives with us is Miss Luci Anna, our little Yorkie and Kandi, our very big American Bulldog. They keep us busy letting them out then in, over and over all day.